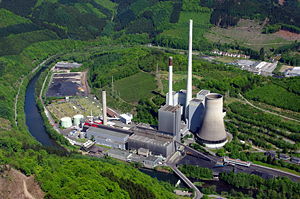 Werdohl-Elverlingsen Power Station is a coal and gas fired power station in the state of North Rhine-Westphalia near Werdohl, Germany on the Lenne river; its water used for cooling. Since 1912, this power station consumes natural gas and coal to produce it' electricity. Its current owner and operator is Mark-E. This page was last edited on 21 March 2019, at 12:26 (UTC).